I offer diverse naturopathic treatments, like Neuro therapy, Homeopathy, Phytotherapy and Bach flowers. In this section you will find more information on these therapies. The neuro therapy descended from conventional medicine and regards itself as a holistic regulation therapy. Aim of the neural therapy treatment is to rebalance on the physiological level control systems which are in disorder. In the healthy body continuous and unconcious coordination processes take place, which manage all organs, muscles, nerves, the connective tissue and the skin. 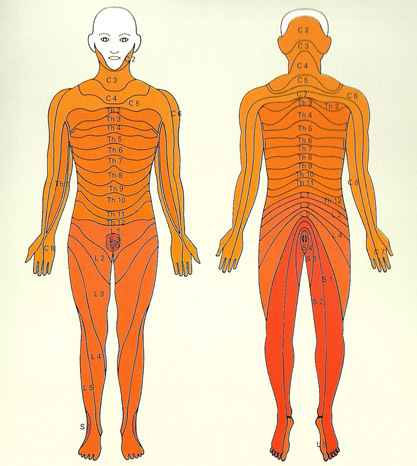 The body´s own control system is capable of compensating small and hardly perceivable dysfunctions. Many little dysfunctions may derail the body´s own self-regulation and make itself perceptible f.e. As pain. The holistic approach of the Neuro Therapy starts from the assumption that f.e. defective teeth, chronical infections of the sinuses and organs, as well as scars may act as negative fields or danger centres and come into question to be causing pain in other parts of the body. The term "Neuro therapy" indicates that the treatment works on the nerves. Practically this is done through injections of local anaesthetics. They tranquilize aching zones of the body, so that they may decontract and the self healing powers start to waken. Through injections in these zones pain in other parts of the body may disappear within seconds. Most commonly the neuro therapy is applied in pain therapy, in cases of migraine, rheumatic pain and neuralgia, as well as inflammation. After accidents and operations it allows a faster rehabilitation. Neural therapy is also used with chronic illnesses, functional and hormon disorders. Other fields of application are stomach problems, angina pectoris, arteriosclerosis, strokes (to abate consequences) and menstrual problems. Arthrosis cannot be healed with neuro therapy but it can help with the pain and have positive impact on the process of inflammation. The same goes for cancer. The neural therapy has no influence on irreversible damage of organs and the skeleton, genetical illnesses or deficiency symptoms. Likes are to be cured with likes. The healing power of plants. Flowers which heal through the soul. Pain Therapy with LifeWave Patches. Copyright © 2011 Clinica De Osteopatia. All rights reserved.